It starts with an extreme, ginormous close-up of Gordon-Levitt telling us his story from the top of the Statue of Liberty with an immaculate view of the Manhattan skyline of the ‘70s behind him. Gordon-Levitt’s French accent may be just barely passable, but his boundless energy and charm make him a great Petit (he was also trained to walk on wire by Petit himself, so there's that). And check out JGL's mad miming and acrobatic skills in the early Paris scenes, in which Zemeckis mimics jaunty new wave French films in bits in black and white, and shots in the grainy color textures of that era. To pull it off, Petit recruits a rag tag crew of accomplices for the coup. First, there’s the lovely Annie (Charlotte Le Bon), who he has a meet-cute with in the streets of Paris – she’s busking Leonard Cohen songs while he upstages and steals her audience with his shenigans on the same block. Then there’s Clément Sibony as a dapper photographer, César Domboy as a math teacher, who is afraid of heights; James Badge Dale as a savvy electronics salesman, Ben Schwartz (Jean-Ralphio from Parks and Recreation!) as a New York recruit, and Steve Valentine as Petit's inside man at the Trade Center as he has an office on the 82nd floor. The pacing really picks up as Petit’s meticulous plotting, 6 years in the making, gets put into action, helped along by longtime Zemeckis collaborator Alan Silvestri's score which takes its jazzy queue from such ‘70s crime capers as THE TAKING OF PELHAM 1,2,3 for the heist-like sequences. 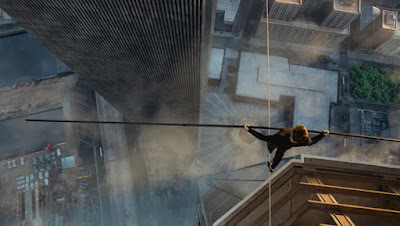 The first half is fine, but as you’d expect it’s the second half involving the staging of the stunt itself that really - forgive me, but it’s right there – reaches incredible heights. Look for cinematographer Dariusz Wolski, and visual effects supervisor Kevin Baillie to get many accolades this upcoming awards season – what these guys did here, helped by an army of digital technicians, of course, is beyond stellar. It's also one of the few 3D films in which the format feels the most necessary.